Shane Shirley : Let's Kick this Bake Sale up a Notch and Really Have Some Fun! You Buy Delicious, Buttery, Organic Cookies at the Patriotic Bake Sale to Benefit Soldier's Kids and I will Twirl a Fire Baton on YouTube! Let's Kick this Bake Sale up a Notch and Really Have Some Fun! You Buy Delicious, Buttery, Organic Cookies at the Patriotic Bake Sale to Benefit Soldier's Kids and I will Twirl a Fire Baton on YouTube! 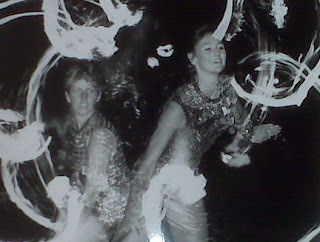 So that is me out in front...ooh I remember how hot that baton is! So we are sold out already of the 3 Pack of organic Patriotic Cookies for our Bake Sale to Benefit Soldier's kids but we still have 8, 12 and 24 packs available. These are really delicious organic cookies made for us by Beautiful Sweets Organic Bakery. For the month of August, when you buy cookies at the Made in America Bake Sale from my Environmental Booty OpenSky Shop, I will donate 100% of the proceeds to use to send Beautiful Sweets, organic, Patriotic Cookies to the kids of some of our Soldiers. So get up off your booty and grab your credit card right now to place your order for these oh sooo buttery cookies! These Beautiful Sweets organic cookies are so good, don't blame me if you get addicted! Then tell all of your friends, family and co-workers in your office to buy some cookies for themselves so that together we can make this bake sale a success, send a ton of cookies to the kids and have some fun with my good old fire batons on YouTube! 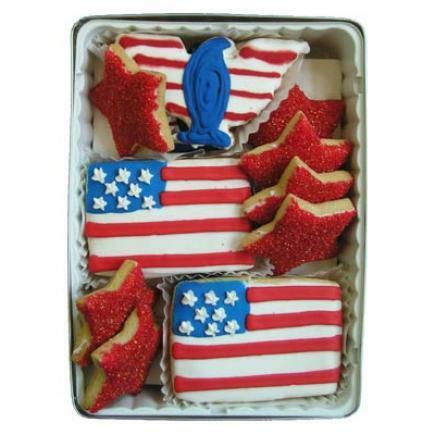 Celebrate the grand 'ol USA with this unique box of tasty, gourmet sugar cookies. Decorated as American Flags, American Eagles, and stars, this gift basket is sure to delight any patriotic American. As seen on the Food Network! Beautiful Sweets has gone completely GREEN! We've switched to gorgeous, Eco-friendly recyclable gift packaging. From the post-consumer recycled boxes to the organic cotton ribbon, the entire package is completely earth friendly.